To help you plan your flow cytometry experiment, we have created a new fluorophore reference guide. 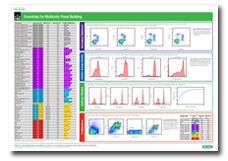 On this free poster, you can find essential information for common flow cytometry fluorophores including optimal laser excitation, maximal emission and relative brightness, as well as handy tips for panel design. Perfect as a reference guide to check fluorophore compatibility before you start your experiments, download now or request your printed copy below.